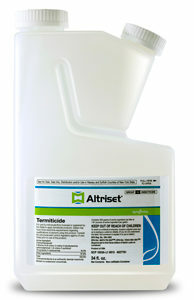 Altriset termiticide can provide long-term structural protection from Eastern subterranean, Formosan and drywood termites. Altriset halts feeding by paralyzing termites’ mouthparts within hours of exposure. Its delayed toxicity means exposed termites can still walk, groom and aggregate for an extended period of time, which enhances the spread of Altriset throughout the termite colony. When used in accordance with the product label, Altriset has a low impact on non-target beneficial organisms like earthworms. In addition, purchases of Altriset count toward qualification for Syngenta’s 2019 PestPartners 365 Program.